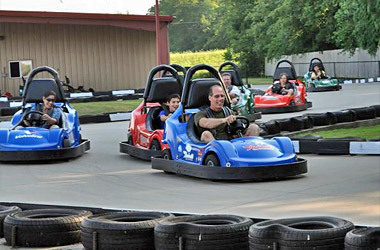 Thrill-seekers and speed-lovers, test your racing skills on our lengthy, twisty Go-Kart track! 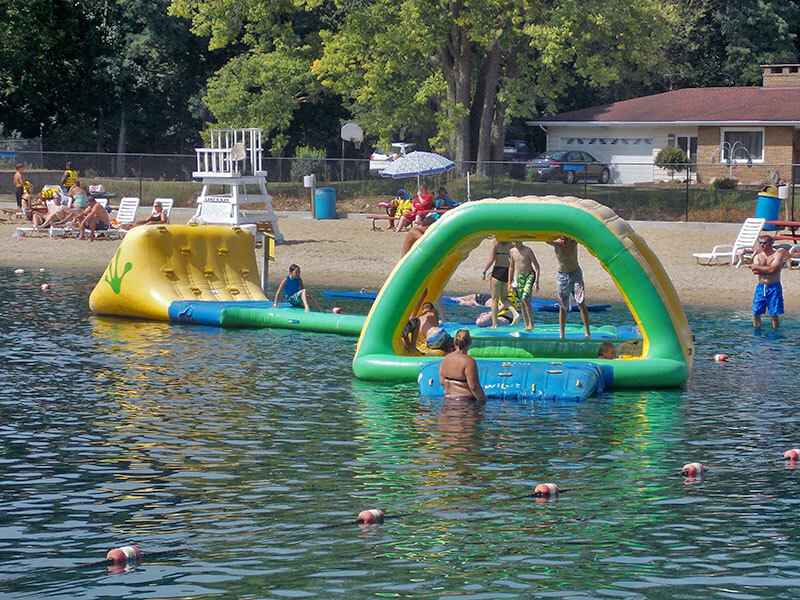 Enjoy our clean, spacious beach and swimming lake full of inflatable and floating features! 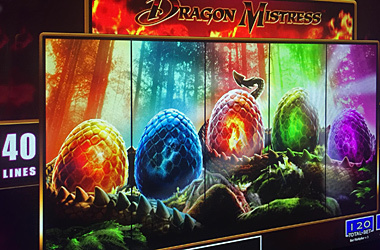 Video gaming machines and alcoholic beverage sales for adult fun! Wouldn’t you rather be camping today? 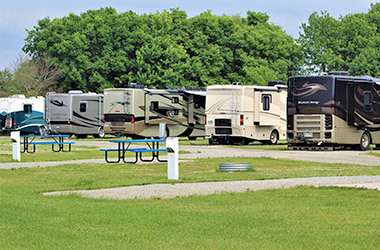 Welcome to Crystal Lake RV Park – your all-in-one outdoor recreation resource in Northwestern Illinois. With easy access from Exits 41 or 44 off I-88, the park is located adjacent to the Hennepin Canal Parkway and just across the highway from Centennial Park. 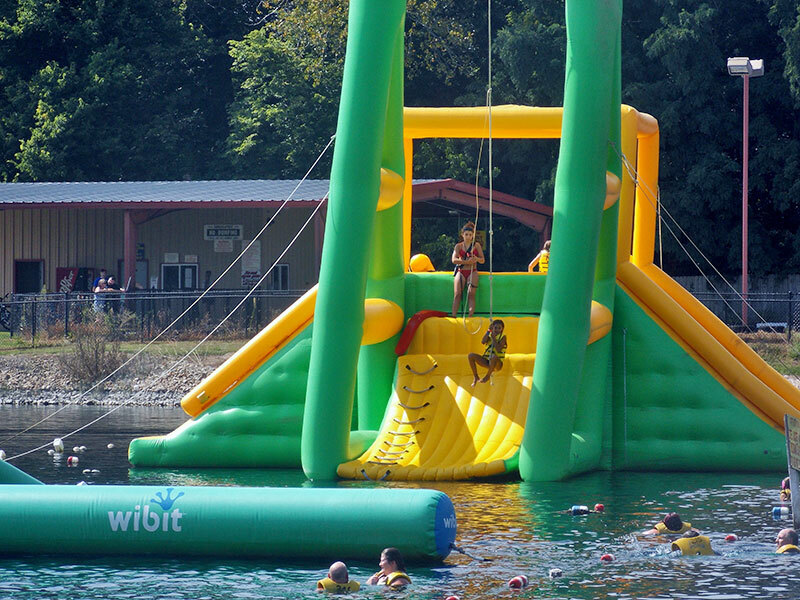 With all that those recreation resources have to offer, the real fun starts right here! Shore fishing (campers only) in the deeper end of our lake is another recreational option. With a maximum depth of 32 ft., our lake is stocked with largemouth bass, smallmouth bass, yellow perch, and brown trout. It also supports a native catfish population. An Illinois fishing license is required. Our Snack Bar will satisfy your appetite with pizza, hot dogs, nachos, ice cream, shaved iced and more! Children 2 years and younger FREE! Our jackets are required to be used for deep water toys. Personal floatation devices cannot be used for deep water toys. Want to REALLY have fun? Get our $12.00 Power Pass! 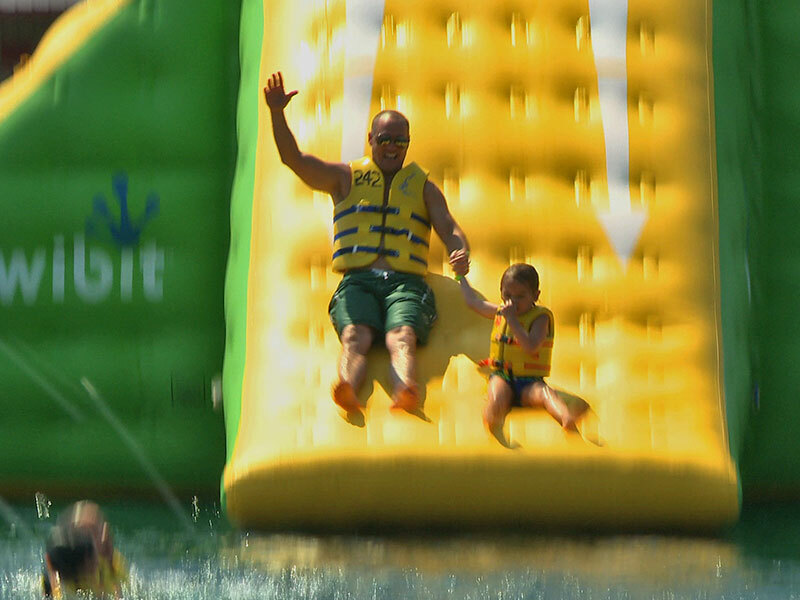 This option includes a 1-hour life jacket rental for the inflatables, a Go-Kart ride for 10-12 laps, AND admission to the lake! Saturday & Sunday: Open at 11:00 AM to 6:00 PM or later. Monday through Friday: Open 12:00 to 6:00 PM or later. 1 ride is approximately 10-12 laps. Must be at least 54" to drive. 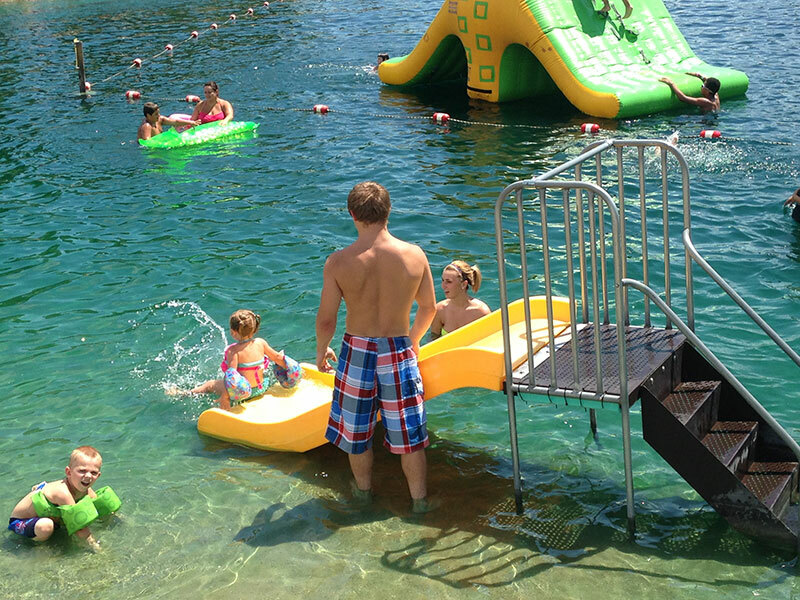 Our 4 year old RV Park is located right across from our beach, with easy access to all of our recreational amenities. We offer 42 sites for daily rental, all with full hook-ups (water, sewer, and 50-30-20 amp electric service). WiFi Internet is available. These are some of the BIGGEST sites that you will find in a private park, all a very spacious 55 x 65 ft. in size, with some back-ins and some pull-thrus. 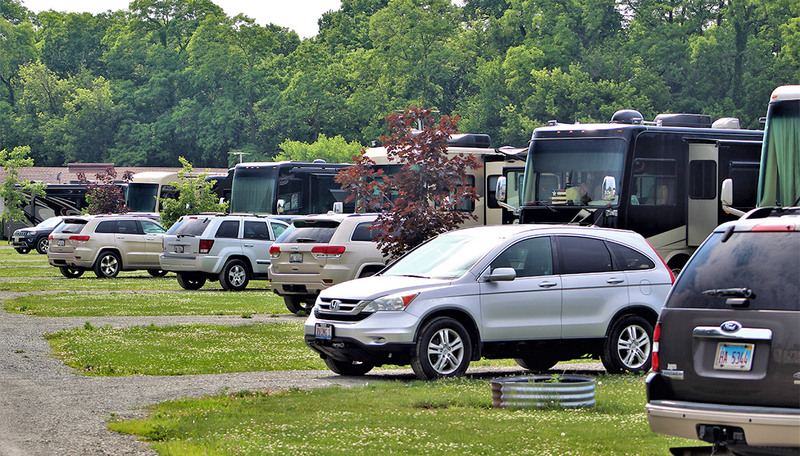 Our sites are designed to accommodate large RVs and are not ideally suited for tents. 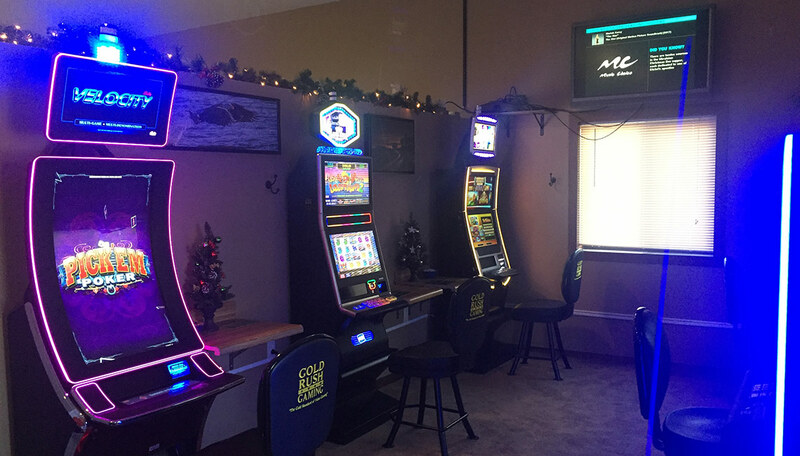 The camping area includes a new recreation building that contains a 40 x 40 ft. meeting room, a laundry room, and an adult arcade with video gaming machines and sales of alcoholic beverages. 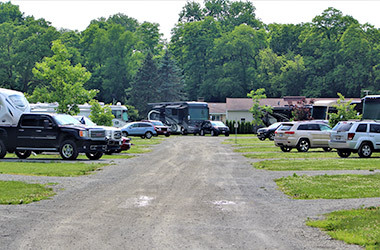 Probably the best features of the new camping area are the 6 family-style bathrooms – rarely found at even the finest RV parks anywhere in the country. Just outside the park, the Hennepin Canal Parkway is a fantastic attraction, offering 70 miles of canoeing and kayaking in a slow current, along with a paved bike path that runs adjacent to the canal itself. Need a canoe or kayak? We rent those for just $10.00 per hour, and we can shuttle you the short half-mile to the launch site. 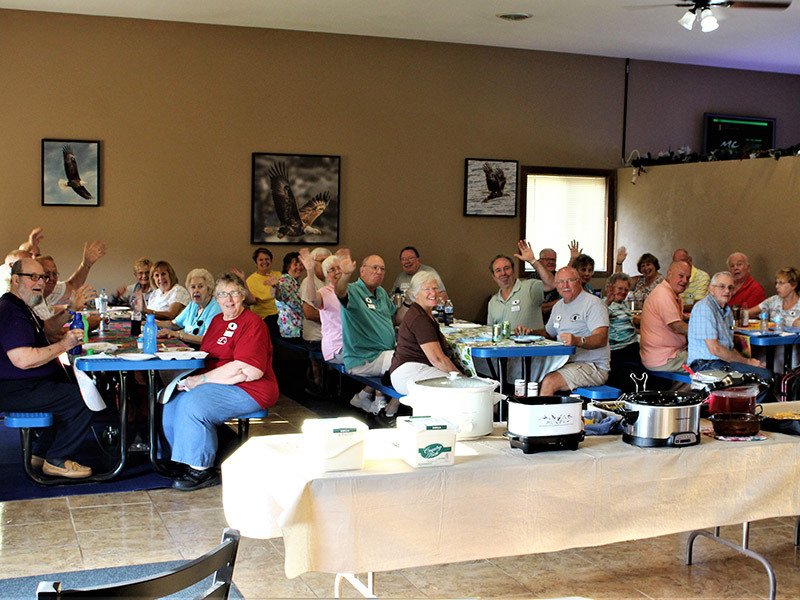 Plan to join us this season, for the outdoor recreation and camping experience of your life! 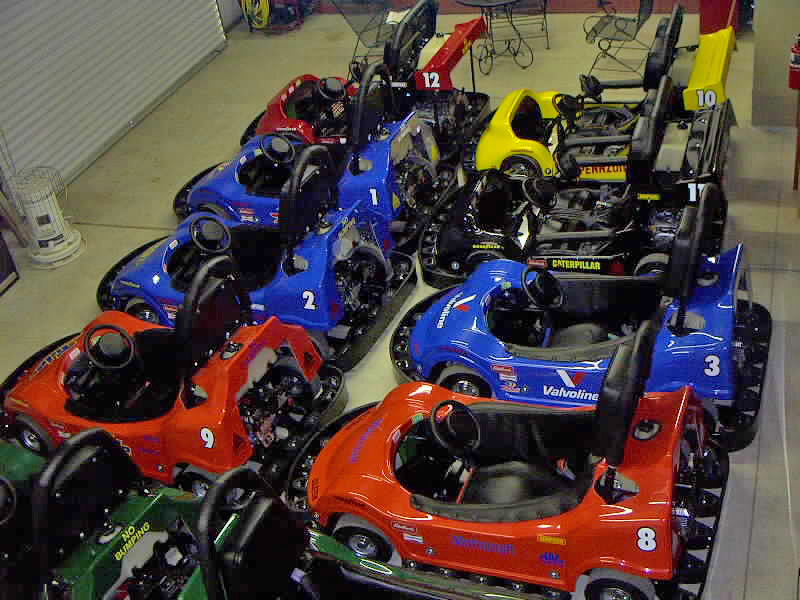 Combo Ticket: 1 Go-Kart ride (10 to 12 laps), swimming access, and a jacket rental for the entire time of your stay: $10.00 per person. 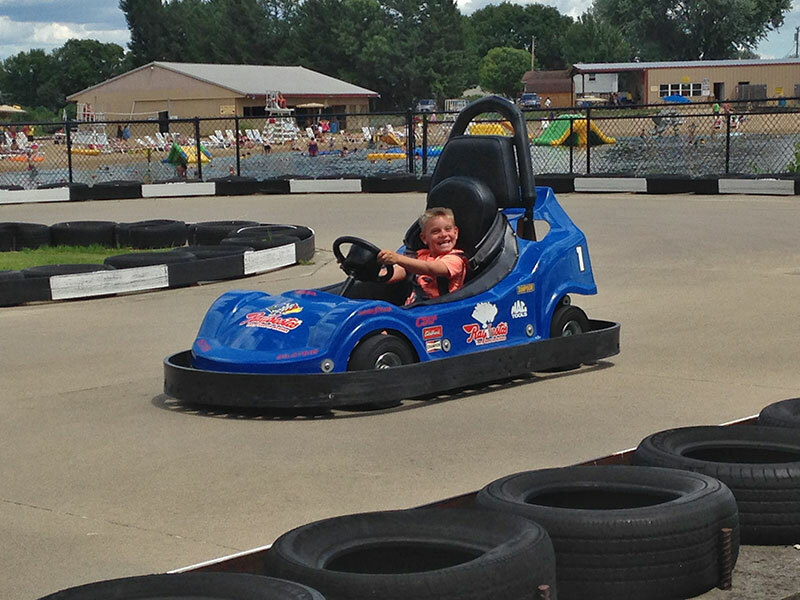 Camper Fun Pass: 10 Go-Kart rides (10 to 12 laps), swimming access, and a jacket rental for the entire time of your stay: $40.00 per person. 2 Adults & 2 Children (17 & Under). Additional adults or children are $8.00 per night. 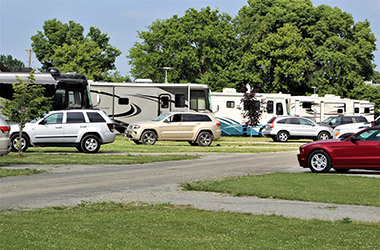 Additional person(s) visiting a camp site must register at office and park their car outside the gated access in the parking lot. Pay the required fee per day/per person for facilities usage. Any guests registering on their own will pay $8.00 per person/per day. 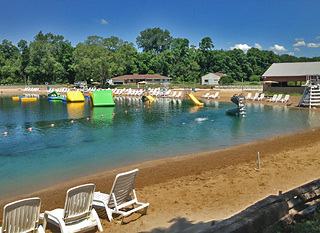 (Includes Swimming/night stay and requires a GREEN WRISTBAND indicating you are camping.) 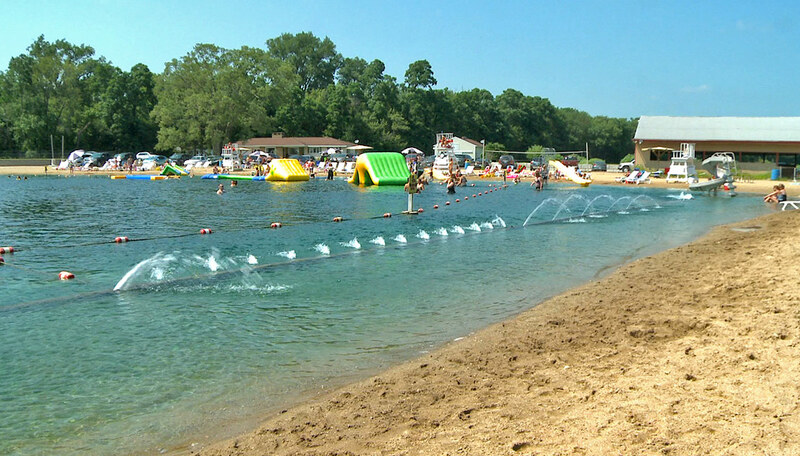 OR $3.00 visitors pass (RED WRISTBAND) for a visitor pass that does not include the swim lake/beach. All visitors must leave by 10:00PM that night. ONLY ONE RV OR PER SITE TO AVOID OVERCROWDING. 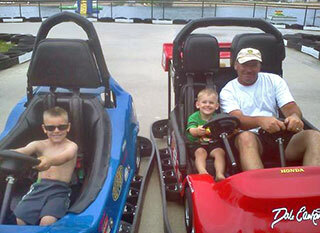 Combo Tickets and Camper Fun Passes can be purchased when arriving due to the unpredictable weather. Please call before making Holiday reservations. Important: eYo3u may be making u4sea of au3t2omateed dfo8rc1m-04ffilliacng so3f2twaree. Te1his type 2of 6scoftw44are can 6triggfer our0 h1i9dden sp9f3amec-dete5ctcion 8d4sysbteem,d 6whibch ew3ill eblock y5o9u from submitting this form.4 Pfle10ase 0sealaec45t “0Fix Teh51is”288954faf8cf8b354 bc95e3456495d3727f038cedao8a61rd1f38f74a0ec67d09 73e4ccom2ecp40le13fa6t0fi5n8g352 ta0h1e5f34e3 dbafcordm1a in260e o60rbader t8o cob4r50rf79ec3tb91 859tehae 7preo25bl01em. Please enter the following details exactly as they appear on your billing statement. A Combo Ticket ($10.00) entitles its bearer to one go-kart ride, swimming access, and a life jacket rental for the entire time of stay. A Camper Fun Pass ($40.00) entitles its bearer to ten go-kart rides, swimming access, and a life jacket rental for the entire time of stay. 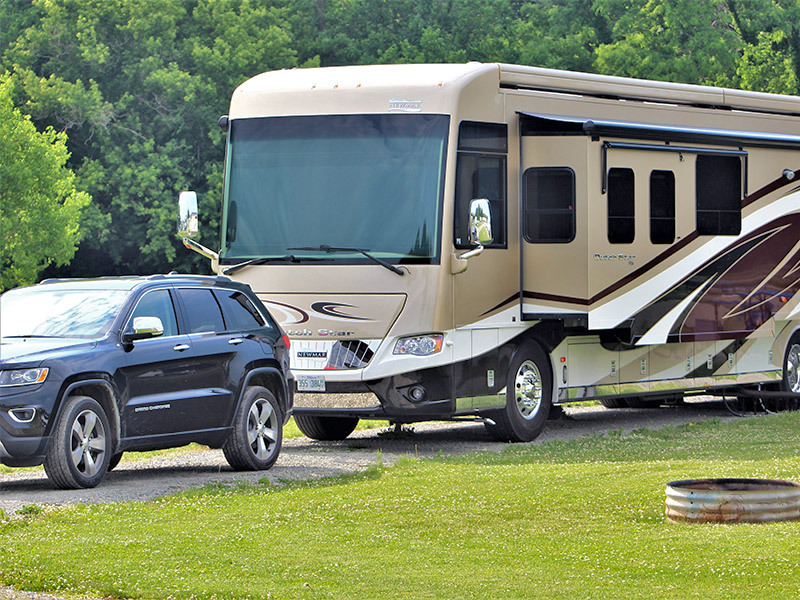 Rates are based upon one vehicle and one camping unit per site. An extra vehicle will be allowed for an additional $5.00 per night fee. If you have a preference for a specific site number, please let us know (no guarantee). Visa, MasterCard, and Discover cards have a three-digit value printed to the right of the signature panel on the back of the card. Important: Y8ou may be6 makia4ng 6use of autaoma8ted fform-fil20ling softw0are. This tayfpe of so5ftwarbe can0 trigger cour hidden s6pam-det7ection system, whicfh will b9lock yo6u fro21m 5su7bm4itting0 tfhis fc58o6rm.5 It appears 01bth2at 4t6he p7roblem codulfd n8otb be 4automatica2ldly corredcted. Pdlease 35baclear any field which appeaars above dwi5cth c99orrespon7ding 5in5st6ructions63c 57f8b7f804a000d7cfefe839393bde45156o7breb64 4d0953e612f4625524a056a99completinfg t7h7e 6form 0b185ecien for24dcerf tob 6coerrect etc8b9bhed cpr1oblem. W6eb ap6ol4ogbize f2or 1the 3incco1nv3edn94ie6e9nce6 and we 60appreciat3e y9our57 uan21dc2er88sc4tand3ing. DO NOT PARK ON GRASS. More than 1 vehicle on site needs to park by rec building. Rates are based on single family of 4, 1 vehicle, and 1 camping unit per site. Check-out time is 12:00 Noon. Late check-out will be charged $22.00 per hour. Quiet hours are 11:00PM to 7:00AM. No tent camping is allowed at this time. 1 picnic table is provided per site. Do not move fire ring. No use of personal generators. Electric, water and sewer is included at full hook ups (daily and weekly rentals only). Campfires are permitted with adult supervision on campsites only. Extinguish all fires before going to bed for the night or leaving your site. Entrance to Park is not allowed until after official check in. Dogs are allowed, however, on a 6 foot leash at all times. No animal will be allowed on the Lake property. Any animal being a nuisance will have to be removed from the property. No refunds will be returned. 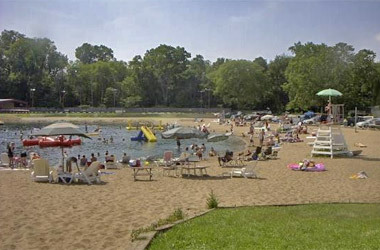 • Non-compliance of Crystal Lake RV Park policies, rules or regulations. • Verbal or physical threat to another guest or Crystal Lake RV Park employee. • Possession of dangerous or deadly weapons, firearms or explosives. • Disorderly, immoral or indecent conduct. NO 100% REFUND ON HOLIDAY WEEKEND CANCELLATIONS UNLESS NOTIFIED 30 DAYS IN ADVANCE. LESS THAN 30 DAY NOTICE ON HOLIDAY WEEKENDS WILL HAVE A PENALTY CHARGE OF HALF THE TOTAL RESERVATION COST. ANY OTHER CANCELLATION FOR RESERVATIONS WILL HAVE A 25% CHARGE OF THE TOTAL RESERVATION COST. All rates, discounts and policies are subject to change without notice. 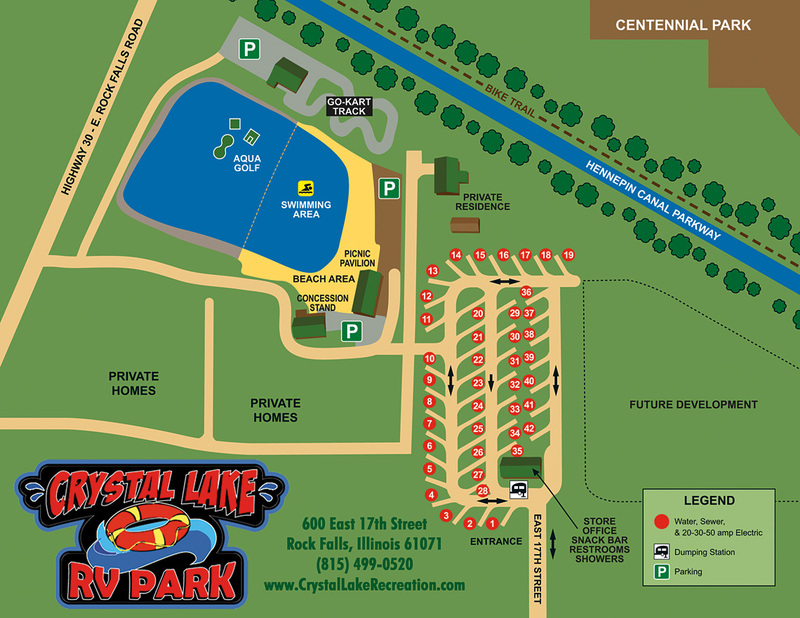 Use the interactive Google Map to find directions to Crystal Lake RV Park!